For bodybuilders, all the muscle in the world means little if it is shrouded by layers of bodyfat . There comes a time when what has been built and hard-earned through the heaviest weights and most intense training sessions, must be displayed to the world. There’s going to be some strict dieting on the horizon, some serious cardio in your future. But it might take something extra to deliver that grainy, striated look of etched musculature. That’s when you add Animal Cuts. Take 1 pack a day for 3 straight weeks. After the week off, you can run it again. From a metabolic point of view, Animal Cuts, is stacked with only the most potent compounds. From green tea extract to oolong tea extract to white tea extract to black tea extract, it’s all covered here. A faster metabolism equates to more efficient fat burning and fewer calories being stored as bodyfat . Compounds designed to elevate metabolism then can mean the difference between success and failure. Finally, we've included compounds designed to deliver the active ingredients (including patented Bioperine) in Animal Cuts more effectively. 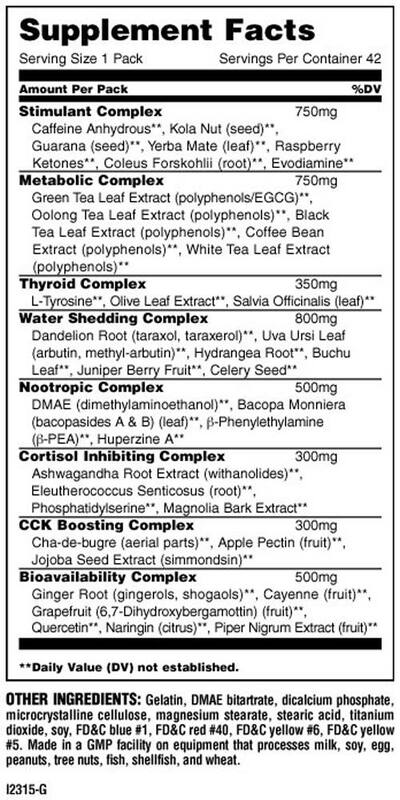 This is the bioavailability complex. Natural compounds like gingerols, shogaols, 6,7-dihydroxybergamottin, naringin, quercetin and the like are used for this purpose. There's no sense wasting a single milligram of the actives found in Animal Cuts.